Cedar Crest bed and breakfast travel guide for romantic, historic and adventure b&b's. 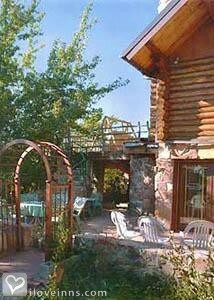 Browse through the iLoveInns.com database of Cedar Crest, New Mexico bed and breakfasts and country inns to find detailed listings that include room rates, special deals and area activities. You can click on the 'check rates and availability' button to contact the innkeeper. Cedar Crest is a beautiful community in the state of New Mexico. It boasts of great hiking or mountain biking on Turquoise Trail. A popular indoor activity in Cedar Crest is visiting the museums in the area, including Tinker Town Museum, and art galleries such as the Local Artist Workshop by Diane Rolnick. The Paa-Ko Ridge Golf Course is popular among the golfers in the state. Cedar Crest also has a skiing resort nearby, Sandia Peak Ski Area, a favorite of both ski boarders and skiers. Sandia and Manzano Mountains are home to many bird species, perfect for bird-watching. Cedar Crest bed and breakfast innkeepers can arrange trips for these areas. By Elaine's, A B&B.